The Mini Laundry Mat guarantees to meet your schedule, expectations! Whether your domestic helper isn’t doing as good a job as you expected, you’re too busy to sit at the Laundromat – waiting while washing your clothes, you’re tired of lugging your laundry bag to the nearest wash and fold service, or you simply just want to be laundry free, the Mini Laundry Mat Ltd. has a solution! 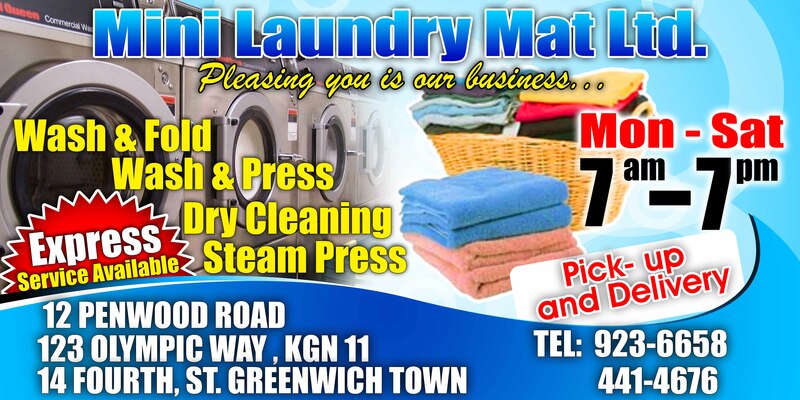 The Mini Laundry Mat Ltd., which is the only Wash/Dry/Fold provider with pickup/delivery service in the Corporate Area and Greater Portmore, offers quality wash and fold services plus dry cleaning at an affordable rate. They even have the clothes picked up straight from your door and returned – fresh and folded, to accommodate your busy corporate schedule. “Since we have over 12 years experience in the laundry business and we only do laundry service, we have virtually eliminated the problems other laundries’ have. No mix-ups. No missing clothes. No ruined clothes. We care about your clothes, and we care about our customers. We know you don’t have the time or energy to drag your clothes down to the laundromat. We do your laundry the way you do it yourself, but we do it better! “Don’t drag the bag!” said Angella Beckford, owner and founder of the 12-year-old laundry mat, convenient and strategically located in Corporate Area. The laundry service also guarantees your clothes will be cleaned in the way you want and expect. “Our laundry service is professional, reliable and can easily accommodate any schedule,” said Beckford. ← Small Business Marketing Trends For 2010!